40×100, 40×120 , 40×140, 60×60, 60×90, 60×120, 60×150 pole tents only. 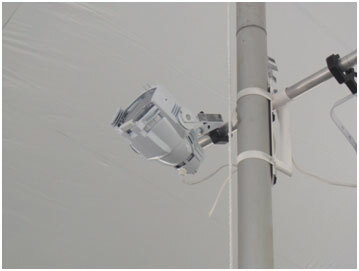 575 watt par lights are the best way to provide general purpose lighting under larger tents. These units are used as up lighting where the lights are focused up into the tent top and provide the best most even lighting under the tent with no hot spots or dark areas. Our crews will install these lights under our tents, connect them to GFCI dimmer boxes (included) installed on the tent sidepoles, hook them up to an electrical outlet, and perform tests to ensure that they are working properly. These lights are the best to provide general lighting under a large tent. Our customer service representatives can help you determine how many you will need based on the size tent you are using. A 30×30 tent would need 2 par lights. A 30×45 tent would need 3 par lights. A 30×60 tent would need 4 par lights. A 30×75 tent would need 5 par lights. A 40×40 tent would need 2 par lights. A 40×60 tent would need 4 par lights. A 40×80 tent would need 6 par lights. A 40×100 tent would need 8 par lights. A 40×120 tent would need 10 par lights. A 40×140 tent would need 12 par lights. A 60×60 tent would need 6 par lights. A 60×90 tent would need 10 par lights.